Birds Carried Your Song Through the Night REMIX ALBUM! 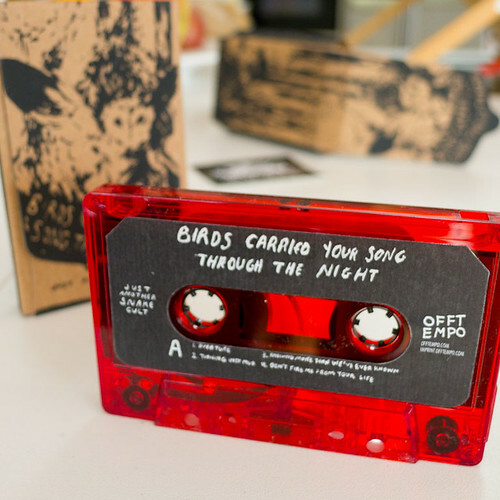 I’m excited to present the REMIX album for the Birds Carried Your Song Through The Night EP. I have contributions from a really eclectic mix of musicians — Vice Wolf, Bypass, DJ Flugvel og Geimskip, Goodbye the Band, Tom Grrrl, Thorir Georg, Nolo, and Lovefest — but they have it in common that they’re fellow home-recording musicians. I’ve met most of them through my years of playing music, in the States and in Iceland. And I’m extremely flattered that they’ve all put their stamp on my songs. Download the whole thing for FREE! Some big changes underway… It’s been such a huge task organizing an 8-person psychedelic pop ensemble. I wanted to capture the passion of Dexys Midnight Runners and the grandiosity of Phil Spector, but kept getting bogged down in the logistics. I feel like David Lynch after shooting Dune — I’m ready for my Blue Velvet. So as fun as it has been to play with such a big group, that chapter is closed (for now at least), and I’m going forward with something quite a bit more agile. I also wanted to share some new material. I spent July alone up in a cabin and made a bunch of headway on writing and recording. 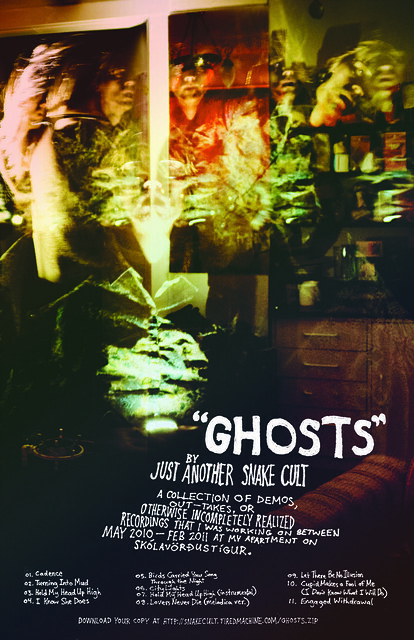 I’m excited to announce that there is a new Just Another Snake Cult cassette coming out! out now and selling out quickly! 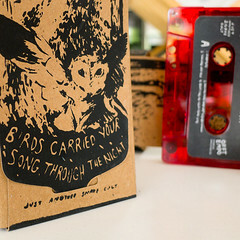 It is titled Birds Carried Your Song Through The Night. It is being released by Off Tempo in a limited edition of 100. It features cover art by my friend Vince Waring. It’ll be released in time for my small California tour (check here for dates). I did a tour of California performing this cassette and it was wonderful. $6. Preorder it now and I’ll pay the shipping (in the US, or Iceland but you’ll have to wait a month). Just send me an email: thor at bandwidthbeta dot com If you’re in Iceland, I’ll have a few copies here soon. For the US and the rest of the world, order directly from Off Tempo. Since January I’ve been hanging out in California, taking care of various things I needed to take care of (and escaping winter). While out here and away from the rest of the band I’ve been doing some solo Just Another Snake Cult performances. I dug my old Ensoniq SQ-80 synthesizer out of my parents’ the garage and arranged a set of songs that I could perform alone. It’s mostly the same songs from previous recordings, but given a stripped down, sparse and atmospheric treatment. I liked the result, and so that’s why I made this EP. This track was originally released as Experiments In Bedroom Pop #3. Go here if you’d like to sign up and receive future tracks in the series. A new track in my newsletter / evolving album, Experiments in Bedroom Pop, is now out. For those interested in those kinds of things, right this way. The experience of missed opportunities has taught me one of the most valuable lessons — to not put things off, to embrace the chaos of going head first into experiences because we have but such a narrow window. (Which is of course easier said than done.) It’s the rare things–the ones you must actively strive most for–that are the most rich. When I think about the internet today, with its widespread free and seemingly-eternal availability of music, we lose that sense of value. Like anything readily available at little cost or effort it’s so easily taken for granted, and the appreciation is much different, much shallower, and much more about our own pleasure than any sort of rich relationship. I had that in mind when I released the Ghosts EP as a “temporal release”—one that it came with an unspecified expiration date. Well, that date has come, and Ghosts is quietly disappearing from the internet. If you jumped on the opportunity to downoad it (a very simple act usually taken for granted) you can now appreciate being one of the few people who can listen to songs like City Lights and Turning Into Mud. 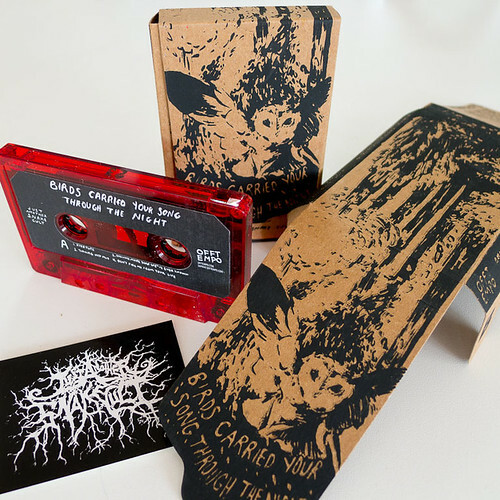 Birds Carried Your Song Through the Night is available on a cassette tape from Wizards of the Ghost. I Know She Does and Engaged Withdrawal are still available as the I Know She Does single (but no longer free of charge). The second edition of my MP3 series, Experiments in Bedroom Pop, just came out. Join up if you want to get it! ANNOUNCING: “Experiments in Bedroom Pop,” the Just Another Snake Cult MP3 club. Think of it as an exclusive, real-time, evolving album with extensive personal liner notes. Sign up today so you can start getting all the tracks starting from the begining. As new songs come out of me they’ll get sent out to all the members of the MP3 club, along with some thoughts on the recording process, the context of the song, or whatever else I think is interesting or pertinent. The “album” as a medium feels so removed from my process. I’m thinking of this as more direct way to share my music with those who take a particular interest in it – one that more reflects its spontaneous nature, and that more actively engages the listener. Sign up now to get this song and other super rare, future songs! To celebrate moving out my apartment (where I record all my music) and going on this tour where we may perhaps be playing some of my songs not on the Dionysian Season album, I decided to put together this collection of demos or otherwise incompletely realized recordings that I’ve been working on over the past few months. This will only be available for a limited time. Who knows what will come next, but it will be of a different place. The poster version is available on this tour. Stream it for free or download it for an extremely low price at Gogoyoko or Bandcamp.